Sinus Tarsi Syndrome results in pain in the foot or ankle caused by inflammatory arthritis or more frequently trauma from an inversion type injury (bringing the foot inward). The tarsi runs between the talus and calcaneus and is a small cone-shaped space that also contains the posterior tibial nerve, as well as the posterior tibial artery and vein. The nerve endings in the sinus tarsi are important for properception (balance for the back part or hind part of the foot). 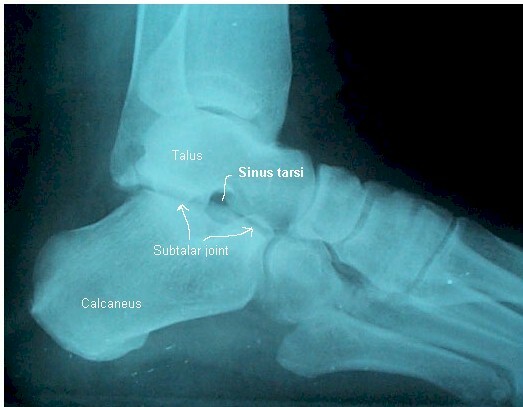 Talocalcaneal ligaments are also located within the sinus tarsi. Diagnosis can be made by a careful clinical evaluation or an injection of anesthetic into the sinus tarsi region, which would alleviate the pain for diagnostic purposes. MRI imaging can also evaluate the calcaneal fibular and anterior talar fibular ligaments for tears, as well as the posterior tibial tendon for swelling or arthritic changes, which may result from these symptoms. It is important to adequately diagnose and treat sinus taris syndrome, since progressive degeneration will affect properception balance and lead to chronic arthritis of the subtalar joint. This joint is very important for moving the foot inwards and outwards or inversion and eversion maneuvers. In cases that do not respond to conservative physical medicine modalities, platelet-rich plasma (PRP) and stem cell therapy may be effective in halting the progression of the degeneration, diminishing the pain associated with the chronic ankle or foot pain, and promoting healing. If you continue to suffer with sinus tarsi syndrome and your current treatment plan leaves you wanting more options, perhaps a fresh set of experienced eyes can change your outlook. Since 1990, Dennis M. Lox, M.D has applied his personal interests in sports medicine, cutting-edge regenerative medicine and chronic pain management to helping patients increase their quality of life. Contact us for an appointment at 727-462-5582.